Properties for sale in Brittany, France - AHIB-1-PI-2069 Nr Uzel 22460 Character 3-4 bedroomed house, large lounge, kitchen, and sauna with 2.5 acres! AHIB-1-PI-2069 Nr Uzel 22460 Character 3-4 bedroomed house, large lounge, kitchen and sauna with 2.5 acres! Are you looking for a house in Brittany where you can arrive and relax, have some fun, "chill", as the saying goes! Well if you are, then this house will suit you, as it has some great features for doing just that. Firstly there is a sauna, how relaxing is that! Also a large spa bath, with a great view over the garden and countryside. Next is a bar and games room, where you can enjoy a cool drink, play darts, and pool. If you want to sit quietly and read, the mezzanine is a small library. The house has some other great features too, a large, farmhouse style, fitted kitchen, 36m2 lounge, cosy with a wood burning stove and beamed ceiling. There is an office, that would make a downstairs bedroom. There are 3 double bedrooms upstairs, along with the mezzanine area. Outside is a double garage, with a handy utility area, a barn and wood store. The garden and land is to the back, and sides of the house. Very flat and private, suitable for horses, or other animals. There is also an orchard, and even a boules court. Part of the house is heated by a wood chip boiler, a very efficient form of heating, this could be extended into the rest of the house. 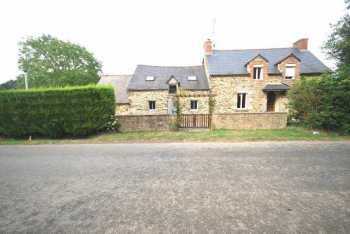 Situated close to the village of Uzel, only 10 minutes to the bigger town of Loudeac, in lovely open countryside. Also only 15 minutes to the fantastic Lac De Guerledan, Brittany's largest lake, more relaxing opportunities there! Or you can walk, swim, horse ride, waterski.. its a great place. This house is currently a home, but as it is available with the white goods, and a lot of furniture, it would make a great rental property. So, if you're stressed with your search for a French house, come and look at this one, then, relax and chill!